Looking for a microbiome meeting or conference to attend in 2018? The Translational Microbiome Research Forum (TMRF) lists thirty-two 2018 conferences, so far, and updates their event page upon announcement of new meetings. A quick survey of the events shows eighteen taking place in the US or Canada, twelve in Europe and Israel, and two in Singapore. Twenty-six of these microbiome conferences are general-interest forums, focusing on technology and microbiome science rather than specific disease or therapeutic areas. Six meetings do have more focused topics. There are meetings that focus on gut brain axis, precision medicine, host resistance, cancer, and HIV. Some are taking place for the first time, such as the 1st International Conference on Oral Mucosal Immunity and Microbiome in Crete, September 26 through October 1. Others are on their 3rd or 4th iteration, while the International Conference on Microbiome is on their 20th annual meeting. Microbiome conferences draw participants from companies, academic institutions, and government agencies. One meeting that does have a more narrow, academic focus is the Keystone Symposia Microbiome, Host Resistance and Disease taking place in Alberta, Canada. Another conference, the 4th Annual Translational Microbiome Conference will host workshops where participants can take a deep dive on different microbiome topics from animal models to data analytics and the intellectual property landscape. Conferences by nature have a backward-looking focus, reviewing studies that have taken place along with some discussion of future studies. The Microbiome Futures meeting taking place in New York City on May 23 "is a landmark forum that will document the future of microbiome research and commercialization." This meeting provides an opportunity to discuss the future of translational microbiome science. 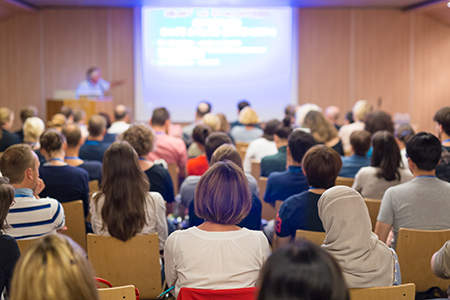 Many larger society or application-focused meetings include sessions on the microbiome, so be sure to check the agenda of your favorite conferences. Also keep an eye out for microbiome webinars sponsored by companies and publications. These are often available as a recording if you missed the real-time event. There are many microbiome meetings and conferences coming in 2018. You should be able to find one that suits your interest and provides an opportunity to network with others in your field.